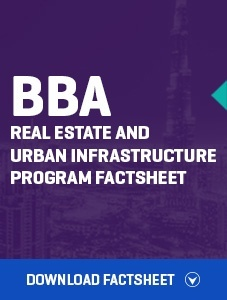 This uniquely designed BBA is aimed to equip students with a strong knowledge base and technical skills for careers paths in real estate and infrastructure related fields. The program has a balanced mix of technical and managerial competencies that are required to flourish in the Indian Real Estate sector. Student should have passed 10+2 grade with minimum 60% marks. Student should have passed 10+2 grade with minimum 55% marks. Work with property consulting firms in valuation, brokerage, marketing, investment banking etc.